The latest six women have joined the Bujingwa Women’s Group in the small town of Igombe. Busega Scotland’s Supervisor, Alphonce Kagezi, and Assistant Project leader, Julieth Godwin, had the pleasure of introducing the new women to the group. The ladies received a grant of about £45 each to develop or open new businesses and another £45 is paid into the group’s vicoba (credit union) on their behalf. This acts as a low interest lending bank for group members, to grow their businesses and meet family emergencies. 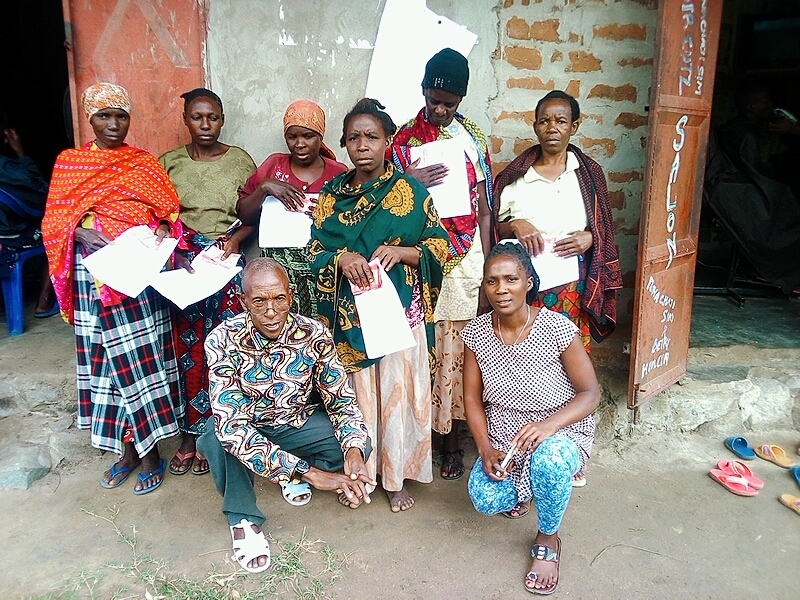 Since January 2018, the existing group of 17 women have increased their Busega Scotland funding of £150 to £550, through their hard work and saving. The Bujingwa Group is Busega Scotland’s fourth women’s group, supporting over one hundred women in total. The Family Support Project’s funds are targeted at women in particular difficulties, as single parents or widows, with low income (perhaps only £25 per month) and generally large families. Sometimes, it is grandparents who care for the children, due to the loss of parents from AIDS and other illnesses. The modest help from our project can help prevent family breakdown and destitution. Regular readers of our news posts will recognise Mr Kagezi, or as we affectionately know him – the King of Igombe. Last year, he was knocked off his motor bike and seriously injured. A marvellous recovery has got him back on his feet, even though his mobility is still a bit limited. All power to the King!